Here's a slight variation on the fresh haddock with egg sauce I posted about two weeks ago. This day I had to be a little resourceful, and this is the result. 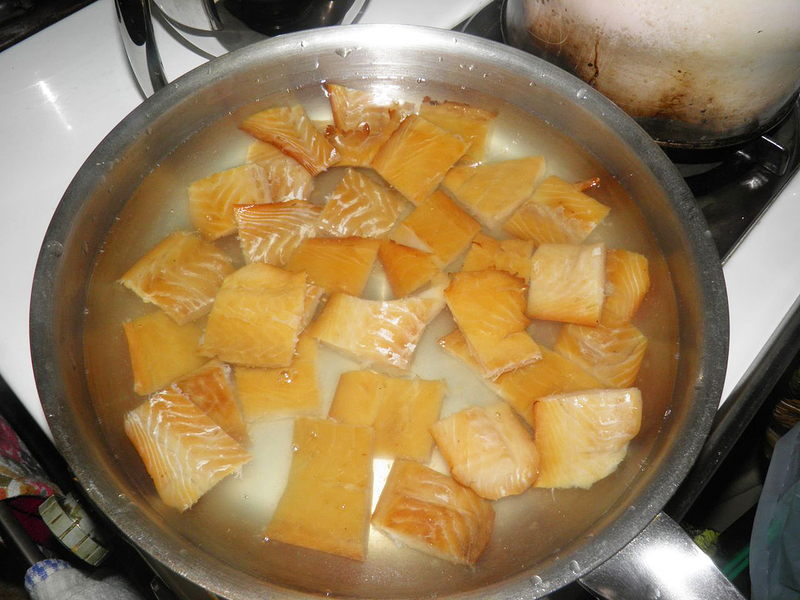 The challenge – smoked fish already sitting on the stove. My mother likes to challenge me – or so I think. Whenever I visit her she always make sure she has a full larder. The thing is, she buys for her cooking, not mine. What that means is the "extras" that make a meal memorable (spices, garlic, etc.) don't make their way into her shopping basket. It's not that I'm a "fancy" cook. It's just that I know by adding a simple ingredient or two and some other on-hand ingredients you can lift something out of the ordinary – with very little effort. We all have to eat. We may as well enjoy it. This time it was smoked fish. Haddock to be exact. Mom purchased it from the a “fish truck” fishmonger. You know what I mean... not a store. He drives around and sells out of the back of his truck. I hate to have her wait on me, although it’s hard to prevent. But I do try to cook for her as much as I can. At least I know she’s taking it easy when I’m doing it. And I believe it gives her some pleasure – and something to talk about with her friends. She has waxed eloquent with them about eggplant parmigiana, spaghetti squash and gnocchi to name just three. I’ve introduced her to several other interesting dishes/ingredients as well. But I had to dream up something to do with this fish that wasn’t too exotic. It’s not that she wouldn’t try something so much that I was taken by surprise and had to rely on what else was in her cupboards. 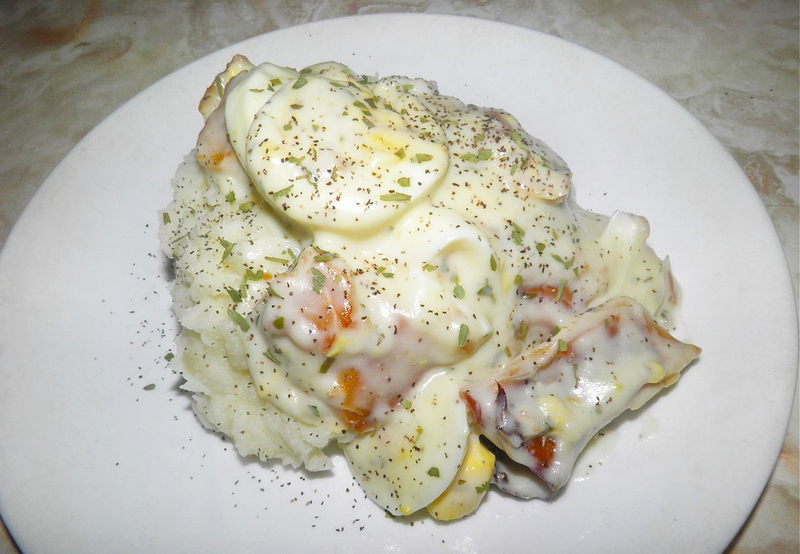 Mom usually cooks the fish in milk, salt and pepper and then drops in eggs to poach. The drawback is that the milk curdles. It still tastes good, but presentation leaves something to be desired. The quick fix for that occurrence is béchamel. A little butter and flour guarantee you’ll have a smooth sauce. But I couldn’t really poach eggs in the béchamel. Hard boiled solved that problem. 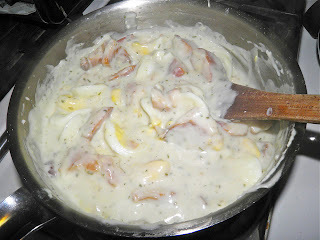 For some added interest I threw just enough tarragon to taste it into the béchamel sauce. Tarragon always goes with fish. I served this on some fluffy mashed potatoes. It was a wonderful meal, with very little effort. Melt the butter in a wide saucepan. Add the flour and whisk until smooth. Cook for about 2 minutes. 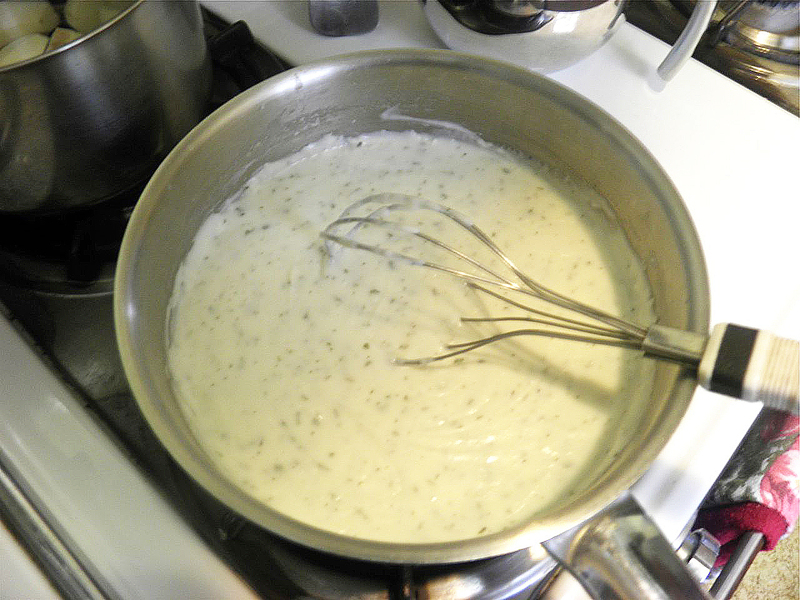 Then slowly add the milk and whisk until thickened, about 2-3 minutes. Add in the tarragon, garlic, pepper and salt (if using). Add the cubed fish to the sauce and let cook for about 3 minutes. Then slice the hard boiled eggs and add to the mixture.